QSBRI is pleased to announce that it has completed accelerated fouling comparison testing of a brazed plate gas cooler installed with Passive Back Flow technology and a spiral gas cooler. Results indicate that the plate gas cooler with PBF maintains its flow throughout the testing while the spiral gas cooler flow decreased and ultimately stopped, resulting in the failure of the system. Complete results will be posted shortly. Please check back regularly and contact us for more details. 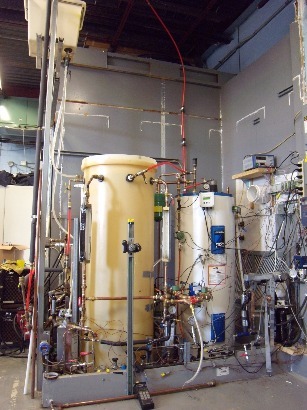 ​Trans-critical CO2 heat pump and water heater fouling comparison test rig. This rig is able to test a variety of heat exchangers/condenser/gas coolers with and without Passive Back Flush technology. 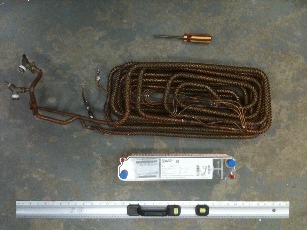 Copper coaxial heat exchanger (above) and a brazed plate heat exchanger (below) designed specifically for trans-critical CO2.